Images for the Future is the largest digitization effort in Europe to date. A consortium of 6 partners (including three archives) is migrating a substantial part of the Dutch audiovisual heritage to a digital environment. The project has three objectives: safeguarding heritage for future generations, creating social- economical value, and supporting innovation in cultural infrastructure. Much is to be expected from recent developments in computer science, especially in the areas of data-mining, information retrieval, and user-audience participation capabilities. To achieve these objectives, the cultural heritage sector is challenged to re-evaluate its business models. This article presents the theoretical framework in which Images for the Future is operating, and substantiates this framework with concrete examples of results. Audiovisual material is a vital component of our heritage, collective memory and identity – all our yesterdays. But in its current analogue format, it is difficult to access. Unlike documents which may last for centuries or even millennia, audiovisual recording materials have a life expectancy best measured in decades. Digitization of analogue carries will ensure future access. Over the past years, technologies for large-scale migration have matured. The same is also true for thinking about migration projects in terms of their efficiency and the workflow models they could follow. Although the process is far from complete, approximately 10 million hours of European audiovisual material has already been digitized (Wright, 2008). Recently, the audiovisual production process shifted from analogue to digital. This so-called ‘born digital’ content is directly ingested in asset management systems and will also be kept for posterity as electronic files. Due to digitization and digital production, audiovisual content collections are transforming from archives of analogue material into very large stores of digital data. Digitization is also a driver to establish new services. Distribution over networks, interoperability with other collections, and flexible integration in other environments are just a few of many properties in this new era of enormous potential for audiovisual archives. Therefore, large-scale digitization efforts not only ensure long-term access, but also have the potential to reveal the social and economic value of the collections. This paper focuses on the latter: the types of services that can be created as a result of large-scale digitization efforts, and the social and economical benefits they bring. Value creation is a key notion, as it determines the factors that legitimize (and determine the level of) investments by the government and funding programs. The case of Images for the Future is exemplary: cultural heritage organizations around the globe are currently reinventing their business propositions. In Sections 2 and 3 this notion is examined using the "business model canvas", a model developed by Alex Osterwalder. In Section 4 we examine the dimensions of business models for cultural heritage and the derived value for a heterogeneous constituency of users, using the "Accumulation, Archiving and Construction" model by Mirko Tobias Schaefer. With this user-centric approach in mind, we look at some examples of services that we have developed in the past year. This lays the foundation for further work. The collections of the Netherlands Institute for Sound and Vision in Hilversum, the National Filmmuseum in Amsterdam, and the National Archive in The Hague safeguard the memory of the Netherlands as captured in moving images over the past hundred years. As is demonstrated below, the collections represent great social and economic value – if and when they become accessible. Large-scale migration of analogue audio-visual material for preservation and access is exceptionally expensive. For Images for the Future it involves the selection, restoration, digitization, encoding and storage of 137,000 hours of video, 20,000 hours of film, 124,000 hours of audio and more than three million photographs. And this is only the beginning. To truly make the material useful, investments will have to be made to enrich the existing metadata so that they can meet requirements for use. Also, services will have to be developed to make the material meaningful and useful for a variety of user groups. Educational institutions, students, teachers, publishers, television and film makers, Web designers, graphic designers, artists, software developers, Internet providers, museums, theatres, heritage institutions, libraries, etc. will all profit from digitally available and accessible content over networks. The total investment of this initiative sums up to 173 million Euros: not an insignificant sum by any means. A strong business model is necessary to support this kind of investment and prove that such an investment will result in long-term socio-economic returns. To substantiate this assumption, the research institute SEO Economisch Onderzoek executed an analysis of costs and benefits of the Images for the Future project (SEO, 2006). This analysis followed the "Research into Effects on Infrastructure" framework defined by the Dutch Ministry of Economic Affairs and the Ministry of Transport (Eigenraam, 2000). This framework shows how the costs and benefits of infrastructural investments such as roads, railways etc. can be determined. In addition to ‘hard’ numbers, environmental and other ‘soft’ effects are an intrinsic part of the analysis. The socio-economic returns of these structural investments are calculated over a substantial period of time: in the case of Images of the Future, this period was set at 30 years. The outcome of the Cost-Benefit analysis was positive: "The total balance of costs and returns of restoring, preserving and digitizing audio-visual material (excluding costs of tax payments) will be between: 20+ and 60+ million’’ (SEO, 2006). The "plus" represents non-quantifiable indirect effects and social benefits that go beyond the users’ benefits. Direct effects concern the market for culture and heritage, and the market for information. The project is financed through the Economic Structure Enhancement Fund. This fund is used to finance large-scale infrastructural investments. Direct effects of the investment are revenues from sales, access for specific user groups, copyright fees for the use of the material, and so on. The indirect effects concern the product markets and labor market. Within the duration of the project (2007-2014), Images for the Future will generate an equivalent of 300 man-years of work. Social benefits take place outside the markets. For Images for the Future these benefits involve effects like the conservation of culture, reinforcement of cultural awareness, reinforcement of democracy through the accessibility of information, increase in multimedia literacy, and contribution to the Lisbon goals set by the EU. It is important to note that much of the material kept by the archives is copyrighted. Images for the Future collaborates closely with this important stakeholder group to ensure that the material is used in accordance with predefined arrangements. The underlying assumption is, "everybody wins"; material is made accessible to end users in a meaningful way, and rights holders receive their fair share of the income generated. Although some of the predicted economic effects are debated, this analysis is in line with other prominent studies on the subject of the effects of digitization, most recently demonstrated in a study on the effects of file sharing in the entertainment industry (Huygen, 2009). Large private enterprises such as Google have signed off on business plans the same underlying assumption (Hal, 2009). Most authors agree that while the new business models have yet to prove durable, it remains crucial to create an environment in which our heritage becomes part of modern intellectual discourse, and that it will create economic value in some form or other. The question remains how to maximize the socio- economic impact of the project. When examining the potential positive return of an investment, it is useful to have a tested model as a starting point. In this case we use the business model canvas, developed by Osterwalder and Pigneur, that has become a popular reference point (Osterwalder, 2003). The cost structure resulting from the business model (Osterwalder, 2003). It is important to note that – using this model – not only the revenue sources have to be taken into account, but also the relationships between the different building blocks that will change as one of the elements changes. In our case, the value proposition of the archive changes while artefacts are being migrated from analogue carriers of information to digital assets. With this migration, the variable cost of distribution decreases tremendously, in turn opening up ways to reach many new client segments that were previously difficult or very expensive to reach. Whereas the main client segment of organizations in the cultural heritage domain used to be limited to professional researchers and program makers who would come to the physical location to conduct research, a larger public can now be engaged in using parts of the archive that have specific interest to them. Naturally, this new group has its own specific requirements and therefore will not necessarily be reached using the same channels and services as the professionals. In table 1, the user groups of Sound and Vision are listed. The organization’s ‘relation’ with its user groups is shifting, and will often take place inside an on-line environment, which in turn changes the nature of the relationship with this group. Instead of a relatively intense, enduring relationship with customers who frequent the building, we are now engaging with a group that may hardly be aware of the institution hosting the content. Similarly, a completely different type of organization will be required to support this new value proposition. Instead of a physical building at the centre of the cost structure, we will quite likely see a shift towards a more platform-driven cost structure. On an organizational level, different skill sets will be required to support the new value proposition. Such organizational change will call for new consideration of questions surrounding outsourcing and in-house development. Thus the business model canvas consists of two distinct parts, the back end that defines the cost structure, and the front end that defines the revenue structure. The business model canvas defines how institutions can capitalize on the new value proposition of digitized audiovisual material. It defines the socio-economic benefits to new client groups in a structured way. With this model as a starting point, we have set out to investigate what could be the most successful value propositions for the client groups that have a vested interest in the content the project is making available. This has resulted in a collection of services that we describe in Section 4. Obviously, Images for the Future does not operate as an island. The project is constantly on the lookout for inspirational business model innovations inside and outside the heritage realm. One interesting example particularly worth mentioning is Saatchi Gallery. Saatchi provides a free on-line platform on which artists can promote their work to a global audience. Painters, photographers, sculptors, graffiti specialists and video artists post high-resolution images of their work, provide details of their biographies and future shows, link to their friends’ sites, and "chat" with other artists and art lovers. Collectors can browse, comment on what they find, and buy works they are interested in by contacting the artist, without dealing with a gallery or auction house. Saatchi Gallery succeeded in changing their business model: they reach new and larger user groups via their on-line platform. In numbers: 600,000 visitors used to visit the Thames-side gallery each year; now the on-line platform receives 70 million views per day (Edgecliffe, 2007). One of the guiding principles of service development at Images for the Future is that it follows a user-centric approach. The consortium believes that value creation always starts with the user - in Osterwalder’s model, the ‘front end’ of the diagram. Everything else is derived from there. The "Accumulation, Archiving and Construction" model proposed by Mirko Tobias Schaefer is used to measure/analyze the activities of users. Schaefer defined this model for structural mapping of the user activities that are often summarized as user-generated content, convergence, collective production and so on. Schaefer divides the model into three domains; Accumulation, Archiving/Organizing, and Construction. This notion is represented in figure 2 below. Accumulation describes all activities that revolve around popular media content and products, for the most part initially developed by corporate companies. Archiving/Organizing takes place on several levels. On an active and intrinsic level, users store artefacts, build archives and reorganize cultural resources and knowledge bases. On a more passive level, archiving work is done by the multitude of fan sites that organize links to related content or the many Web logs and Web forums that share content originally produced by corporate companies. Construction is production occurring outside established culture industries. It describes the emergence of new distribution and production means that are not institutionalized and not necessarily controlled by an owner, but generally are at the user's disposal. It describes the production of new content and new technologies, as opposed to media that comment on or relate directly to popular media productions (Schaefer, 2008). He writes: "These three domains are not mutually exclusive and overlap to a certain extent. The logic of electronic distribution and the copying of files applies to all of them." This model puts users in the centre of the analysis. It needs to be noted that, to a certain degree, the use of the model is an arbitrary exercise. Nevertheless, it provides a way to map differences and similarities between the services offered. In section 4.2 we use this model to analyze the way users interact with the Images for the Future services described in section 4.1. Digitized (or born-digital) collections can be put to use as educational material, as sources for television programs, in Web applications, in games, and so on. The starting point is the realization of the broadest possible access to the content, both for developers and end users. As already mentioned in Section 2, it is of vital importance to make arrangements with rights holders regarding the reuse of copyrighted material. Various services were set up after Images for the Future was launched in the summer of 2007. Below, the most significant services are described. The educational sector is the most important target group for Images for the Future, also in terms of revenue; 60% of the income generated from the project is expected to come from services aimed at this market. Using digitized heritage as flexible learning objects is a very promising development and is beneficial for learners of all ages (Mizuko, 2008). Images for the Future provides access to the content of existing services, such as Teleblik and Academia (http://www.teleblik.nl, http://www.academia.nl, platforms for primary/secondary and higher education respectively) and also develops new services, ED*IT being the flagship initiative. ED*IT (http://www.ed-it.nu/) is a multi-media educational platform that can be fully integrated into existing learning environments. The service will be used for the first time in the 2009-2010 school year and will offer content from Sound and Vision, the Filmmuseum, Public Broadcasters, Nationaal Archief (the National Archive of the Netherlands), and four museums within the fields of technology, national history, history and ethnography. This includes thousands of written sources, tens of thousands of video clips, and hundreds of thousands of stills. The editorial board is made up of experts from the educational broadcasting and library sector. This way, ED*IT can guarantee that metadata and contextual information is fully in line with current educational practice and timely subject matters. Teachers can create their own lesson templates, use already existing ones, or collaborate with peers to co-create material. The foundations of ED*IT lie in existing and widely adopted services for authentication and metadata management operated by Kennisnet. Its design and applications are developed in such a way that it can be used next to, or as substitute for, existing learning materials. The platform offers the ability to search, edit and create on-line lessons, papers and presentations, timelines, and so on. Finally, the ED*IT platform also allows users to upload their own material so it can be integrated into presentations. In a separate project, "Les 2.0", ready-to-use lessons are created using ED*IT material. Schools register for ED*IT and pay an annual fee based on the number of students accessing the service. In February 2009, this fee was set at €1.85 per student in primary education for a two-year contract. The fee for secondary education is one Euro higher. Sound and Vision and Knowledgeland are developing Open Images (http://www.openimages.org). The aim of this platform is to offer on-line access to a selection of archive material to stimulate creative reuse. Reuse includes remixing of archive footage into new videos. The selection will be based on certain properties. For example, excerpts of already distributed DVDs that make use of archival content will be included to act as teasers. A similar business model is used by Prelinger Archives. This footage agency offers free, high quality downloads of over 2,000 items through the Internet Archive and still generates revenue from this material. In a recent keynote address, Rick Prelinger (director of Prelinger archives) asks the fundamental question: "How do you give away something and sell it at the same time?" He proposes two levels: free and fee. At the free level, you can download everything you want from the Internet Archive. But use is at your own risk and there is no detailed contract concerning copyrights. At the fee level, you can get physical materials and written license agreements with your name at the top. This strategy has proven to be very successful for Prelinger Archives and serves as an example for others to follow. A recent example is provided by Monty Python. After the launch of their YouTube channel, sales of their DVD’s increased by 23,000 % (Mashable, 2009). Open Images supports interlinking with other data sources (like Wikipedia), allowing the easy creation of mashups between data sources. Access to the content is based on the Creative Commons model, which proposes a middle way to rights management, rather than the extremes of the pure public domain or the reservation of all rights (Lessig, 2006). The ‘open’ nature of the project is underscored by the adaption of open video formats (notably Ogg) and the use of open source software (MMbase) for its infrastructure. Software resulting from Open Images will also be released under an open source license. To stimulate the uptake of the philosophy behind Open Images, Sound and Vision joined the Open Video Alliance, an ad-hoc group of organizations dedicated to fostering the growth of open video. As one of the first public results, a comprehensive list of open source video software has been created by researchers at Sound and Vision and is now being updated continuously by members of the Alliance. The Open Images platform will contain hundreds of items when it is launched in June 2009. Although annotations (metadata) created by cataloguers provide key knowledge of the collection of Sound and Vision, they also have fundamental limitations. For example, given the substantial amount of time it takes to generate them, they will not provide a lot of detail; they are also bound to be subjective and only cover one interpretation, where there are many. In short: manual annotations often lack the contextual knowledge required by value content. The aim of the Sound and Vision Wiki (http://www.beeldengeluidwiki.nl) is to add contextual information to the collection of Sound and Vision by inviting "The Commons" to document and share their knowledge about programs, media personalities and media related topics. This is not restricted to universities or journalists: a broad constituency of enthusiasts should be encouraged to contribute to their heart's content. The Sound and Vision Wiki was launched in February 2008. 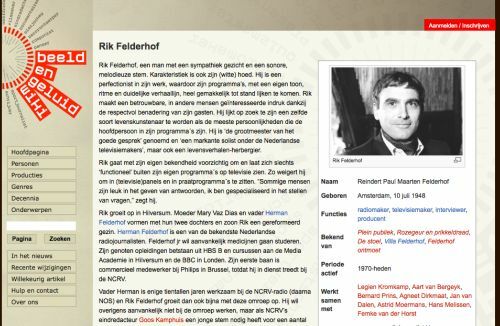 Currently, this semi-curated wiki (people have to register) features over 2.000 articles related to Dutch television programs and 400 biographies of media-personalities written by students, academics, curators, and other enthusiasts. The eventual goal is to have 50,000 lemmas by 2014. Offering provenance and reliability are two preconditions to the success of the project. First, two staff members of Sound and Vision continuously monitor the contributions. They are assisted by a larger so-called "expert council". Second, the Wiki uses the MediaWiki platform used by Wikipedia. Contributors are required to register to the site first, and by doing so, to the use of the Creative Commons " Attribution-Share Alike 3.0" license, allowing others to use the articles in new publications (Beeldengeluidwiki, 2009). This resource exists next to the institutional catalogue governed by professional cataloguers. Within the BRIDGE project, the Wiki will be linked to this catalogue, and to other sources on the Web that are centred on entities, themes and events (Bridge, 2009). These activities will improve access to the collections, and subsequently income generated for reuse. Within the project Images for the Future, 1.2 million photographs will be digitized. One of the main goals of the project is that the material be broadly accessible. However, a lot of the items in the collections (in this case from the Nationaal Archief) lack adequate metadata. At present, professional cataloguers and a relatively small group of dedicated volunteers add metadata and contextual information. Given the vast quantity of stills that need to be annotated, the Nationaal Archief realized they needed a broader public to help them and decided to join The Commons initiative. The Commons was launched early in 2008 as a collaboration between the Library of Congress (LoC) and Flickr. The LoC had been looking for a Web 2.0 partner for its digitized collection. On Flickr, 3 million photographs are uploaded daily. Currently, over 3 billion photographs are available through Flickr, and there are 25 million unique tags (Flickr 2008). Flickr’s community of passionate photography lovers, its availability in eight languages, and approval of the infrastructure of the site led to the Library’s decision to collaborate on this with Flickr. In the course of 2.5 days, the photos of the Library of Congress were supplied with 20.000 tags. To quote Clay Shirky, adjunct professor at NYU: "Metadata has been democratized" (Shirky, 2008). Metadata belongs no longer only to professionals, but to everybody. Currently, twenty archives contribute to The Commons, a number that will steadily increase. It’s important to note that participating institutions only publish material that is free of copyright restrictions under a "no known copyright restrictions" rights statement (Flickr, 2009). In November 2008, the Nationaal Archief (together with their partner Spaarnestad Photo) released a collection of several hundred photos. 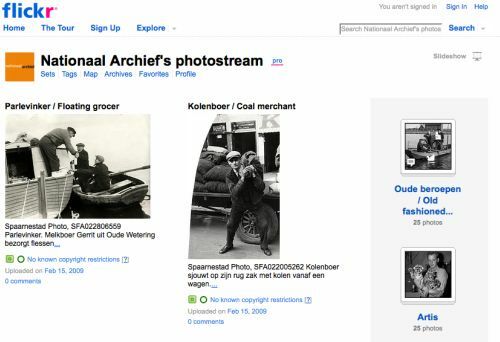 In the first two weeks, the photos of the Nationaal Archief had already received 400,000 views, and hundreds of comments and tags had been added, an overwhelming success. Currently, the Nationaal Archief investigates how these tags can be used to enrich their exciting catalogue, a timely research topic (Trant, 2008, Weinberger, 2007). Inspiration for this game came from the ESP Game (http://www.gwap.com/), originally conceived by Luis von Ahn of Carnegie Mellon University. The rules of this game are simple. A user can chose from different channels (newsreels, talk shows, reality TV, documentaries etc.) on which videos are running consecutively. The user is automatically matched with a random partner. The partners do not know each other's identity and they cannot communicate. Once matched, they will both be shown the same video. Their task is to agree on a word that would be an appropriate label for what is visible on-screen. They both enter possible tags, and once a tag is entered by both partners (not necessarily at the same time), that tag is agreed upon. Players receive points, based on the temporal agreement with other users. User participation is vital to the success of the video tagging game, so a lot of attention is given to providing attractive game play, i.e. the experiences during the interaction with the game. In 2007, Sound and Vision was one of the first archives in Europe to offer access to a selection of their collection though a branded channel on YouTube. 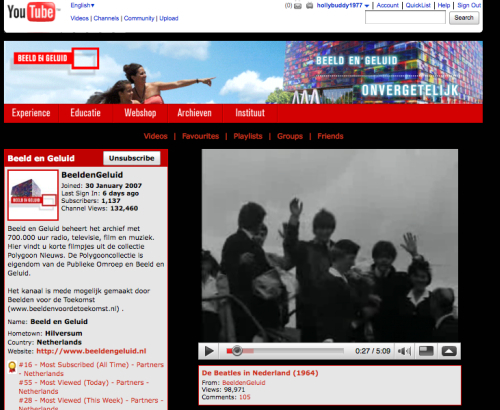 Currently, over 200 items can be viewed on-line: most of them originate from the newsreel collection. The clips have been viewed a stunning 1.2 million times, making the YouTube branded channel one of the most visited in The Netherlands. With this collaboration, Sound and Vision reaches a broad audience. Interestingly, 1,100+ users have registered to the feeds of the Branded Channel, and many of them add comments. Sound and Vision also uses the channel to promote events and (more recently) to promote the use of the Sound and Vision Wiki. The "creative industry" is an umbrella term for companies that include publishers, television and film producers, distributors, broadcasters, Internet providers and so on. Next to the education sector and the general audience, the creative industry is the third target audience for Images for the Future. Services are still in the developmental stage, but will include an on-line footage sales platform aimed at the international professional market, for example. Furthermore, negotiations are ongoing between the Images for the Future consortium and rights holders about the possibility of offering access to our collections in libraries through existing services operated by the Netherlands Public Library Association (VOB), notably its common catalogue Bibliotheek.nl. This would be a major step forward in reaching out to a wider audience. In parallel, the VOB will introduce so-called Web 2.0 functionalities on Bibliotheek.nl, allowing users to tag, review and rate the library’s contents. Finally, the consortium is working on a number of so-called "Gems": relatively small-scale campaigns aiming to present the outcomes of the project in innovative ways. They include Celluloid Remix, a competition where clips from the earliest decades of Dutch cinema are published and presented as building blocks for new videos. The Gem Pinkpop Time Machine uses the most recent developments in visual and audio data mining technology so that 40 years of Pinkpop, the oldest annual festival in the world, can be accessed and explored in an experimental manner. If we try to plot the cases on the ‘Accumulation, Archiving and Construction’ map, it becomes clear that Images for the Future already offers various value creations by users. As mentioned earlier, the three domains can overlap. YouTube and Flickr provide platforms for the storage, annotation and distribution of videos. These services combine professional and non-professional content, and also serve as a platform for community involvement. Although content can be placed on other platforms, most activities take place on the institutionalized platforms. ED*IT combines institutional- and user-generated content and offers the possibility for users to create new productions (i.e. lesson templates, timelines, presentations and so on). Construction takes place outside of the professional realm, so ED*IT is positioned towards Construction. Open Images is based on a completely ‘open’ philosophy. The platform encourages users to remix content and distribute these new productions on whatever channel they prefer. Open Images uses Creative Commons licenses so that people will be obligated to mention the source of the material they use from contributing archives. Several services are placed between the nodes Construction and Archiving. The Sound and Vision Wiki, for example, is used primarily as a platform to gather contextual information on the collection collectively. 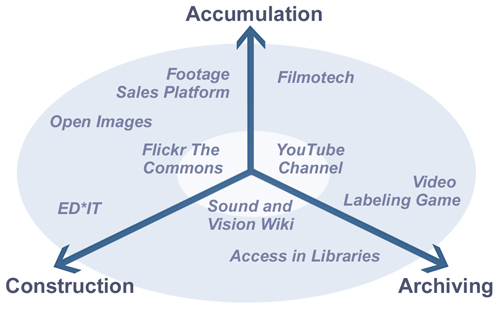 The initiative that aims at providing access to audiovisual content in libraries is positioned near the Archive node, as its goal is to structurally access heterogeneous sources (books, magazines, videos, CDs), using Web 2.0 to add valuable information to the catalogue. The Footage Library is the only service in the model that mainly targets professionals. A fee needs to be paid to rights holders to repurpose (remix) archive holdings. Filmotech.nl has the same business proposition, but aims (primarily) at the consumer market. Here Accumulation relates to the way this platform allows users to watch archive content next to more current releases. The Video Labeling game will result in tags that relate to visual concepts in videos. In a second phase, these will be used to provide users with more fine-grained search capabilities. Therefore, it is placed close to the Archiving node. The table below is a summary of the value proposition for each of the services, as well as a classification of the nature of participation by users. The relative significance of an activity in a given service is represented by its font size. Allowing access to material in near-broadcast quality for reuse in new productions. Facilitate orders of high-quality material. Offer snippets from DVDs as teaser. Using outside knowledge to secure knowledge on the collection and by doing so, increasing accessibility and reuse. Using outside knowledge to secure knowledge on the collection. Using an existing platform (plus active community) as a proportional tool. Using outside knowledge to secure knowledge on the collection in a game-like setting. Use space for advertising. Using an existing platform (plus active community) as a proportional tool. Offer access to a part of the collection to professionals in the creative industry. Fee based on type of reuse and intended audience. Offer access to a part of the collection in a platform aimed (at least initially) at the consumer market. Income is generated on a pay-per-view basis. Negotiate a fee with copyright holders concerning the availability of content in libraries. Charge for access through lending fees or subscriptions. Using Web2.0 to enhance search experience. The table shows how value is created in different ways. The current portfolio of services already covers the three corners of user-centered value creation. Interestingly, ED*IT, Footage Sales Platform and Filmotec (that generate direct revenue, measured in Euro’s) are all tied to Accumulation. Schaefer notes how "this domain […] has considerable potential for confrontations between users and copyright holders" (Schaefer, 2008). However, Images for the Future approaches the relationship between users less as a confrontation between conflicting interests. Copyright holders are by definition an integral part of the business model, as a constituent in the "Partner Network", so new services also benefit them. A myriad of services can be created as cultural heritage splashes into the digital age. Due to user-demand, growing availability of digital collections, increased connectivity, maturing of data mining and semantic Web technology (to name just a few), thinking about services is evolving at an increasingly rapid pace. There is clear interest in well-documented and tested services that add value to digitized collections that can serve as best practices. New value propositions are key in giving organizations the perspective, the confidence, the contacts, the tools and the funding to launch major digitization projects (Blue, 2008). In this article, the notion of service development by cultural heritage institutions has been linked to value creation by users. Perhaps not surprisingly, business models can be based on a variety of value creations, from subscription-based models (i.e. ED*IT) to completely free services (i.e. Open Images). This exercise proved to be insightful. It provides proof that digitized cultural heritage can be used in endless ways and within various contexts, meeting expectations of a heterogeneous group of users. Initial findings are encouraging. In the Netherlands, for example, organizations working within Images for the Future have recently witnessed a steep rise in requests by professionals, in consumer sales, and in the utilization of material in education. Also, public-private partnerships are being forged and will certainly increase the impact of the project through (for example) its employment over new distribution channels and devices. As we increasingly live our lives on-line, we need to be sure cultural heritage stays paramount. Images for the Future aims to create a framework for action that will advance thinking in this area to make this a reality. The authors would like to express their appreciation for the valuable input provided by Wietske van den Heuvel and Marcel Oosterwijk. Eigenraam, C., C. Koopmans, et al. (2000). Evaluatie van infrastructuurprojecten; leidraad voor kosten-batenanalyse, Deel I: Hoofdrapport & Deel II: Capita Selecta. Den Haag: Centraal Planbureau. Huygen, A., P. Rutten, S. Limonard (2009). "Ups and downs". Economische gevolgen van filesharing voor muziek, film en games. Delft: TNO. Mizuko, I. [et. al.] (2008). Living and Learning with New Media: Summary of Findings from the Digital Youth Project. The John D. and Catherine T. MacArthur Foundation Reports on Digital Media and Learning, November 2008. Osterwalder, A. and Y. Pigneur (2003). "Towards Strategy and Information Systems Alignment through a Business Model Ontology". Proceedings of the Annual Conference of the Strategic Management Society. SEO (2006). Images for the Future: Outline of benefits. Amsterdam: SEO Economisch Onderzoek. Weinberg, D. (2007). Everything Is Miscellaneous: The Power of the New Digital Disorder. New York: Times Books.